Today, Judge Jon S. Tigar of the United States District Court for the Northern District of California recognized the merit of our claims against Greenpeace and their allies. In a recent filing in our case against them in Canada, Greenpeace’s lawyers have made another astonishing and hypocritical assertion – namely, that Resolute’s attempts on this blog to inform the public about Greenpeace’s failure to comply with a court order is somehow “disparaging” to their organization. Our public statements about their use of legal maneuvering and delay tactics are entirely accurate. The deadline set by the court passed, more than 10 weeks ago. Resolute delivered its affidavit of documents disclosing more than 20,000 documents; Greenpeace continues to defy the court order and has not produced an affidavit of documents, although they’ve had more than 2 years to do so. Yet it is “disparaging” for us to point out these facts and question the reasons why? Let’s not forget that for years, Greenpeace has “disparaged” Resolute, calling our company “Forest Destroyers” among other false and misleading claims. In reality, our company has been internationally recognized for our stellar environmental record. Among other things, we have planted over a billion trees in the boreal forest, significantly cut our carbon footprint, invested in renewable energy, and have improved the forest’s ability to absorb greenhouse gases using methods recognized and encouraged by the U.N. Intergovernmental Panel on Climate Change. In one report that has been cited repeatedly throughout their campaign, Greenpeace doctored photos to falsely assert that Resolute had developed roads and was harvesting in restricted areas. Despite retracting and admitting their statements were false, Greenpeace continued to make inaccurate and deceptive allegations months later. Greenpeace’s claims about our company are not just disparaging, they are false and defamatory. Further, we pointed out to the court that defiance of the law is a common practice for Greenpeace, specifically referring to comments made by Greenpeace Canada Director Joanna Kerr. In an interview, Kerr told the Journal Pioneer newspaper she “would knowingly break the law as a ‘tactical or strategic’ move to draw attention to a cause.” In this latest filing, Greenpeace lawyers claimed her remarks were “about civil disobedience in general” and that “Greenpeace respects both the court and its processes.” So by their own account, Greenpeace will break the law when it pleases but not in this instance? Does that seem trustworthy? But we know that Greenpeace has a long track record of disregarding both legal and cultural boundaries. Greenpeace is reported to have hired “vandals” to destroy farmers’ crops in Thailand; sentenced for breaking into a nuclear power plant in France and setting off fireworks to simulate a “malicious attack”; were accused of “burglary, vandalism, trespassing and inducing panic” in Cincinnati; were cited by the government of India for “financial fraud and falsification of data”; were labeled part of a “growing security threat” by national law enforcement in Canada; inflicted long-term harms on the Inuit economy with their campaigns; and were charged and fined by the Peruvian government after admitting to irreparably damaging the historic Nazca lines. The public deserves to know the full truth about Greenpeace’s misconduct. In fact, we have a moral obligation to continue doing so in an effort to set the record straight and defend our integrity. And, as we’ve pointed out time and again, Greenpeace has continued to thwart their court-ordered obligations, raising serious questions about what exactly they are afraid will be revealed. As part of our ongoing litigation against Greenpeace in Canada, the court rightly ordered both parties to make documentary disclosure by December 15. During this process, both parties are required to exchange documents relevant to the litigation. Resolute delivered its affidavit of documents disclosing more than 20,000 documents. Greenpeace has failed to comply with the court order and has not made any documentary disclosure. For several years, Greenpeace has used legal maneuvering to delay court deadlines and avoid the discovery process. Now, they are simply evading court deadlines altogether. As we’ve seen time and again, Greenpeace continuously fails to take responsibility for their harmful actions. This time, Greenpeace is defying their court-ordered responsibility to produce documents that are vital to this case. Greenpeace’s countless motions, procedural delays and outright failure to comply with the Court’s order to make documentary disclosure raise serious questions about their credibility and legitimacy. What exactly is Greenpeace attempting to hide? Greenpeace’s failure to respond to the courts in this case is symptomatic of its general unwillingness to respond to anyone who demands answers or accountability from them. For years, Greenpeace has shown indifference to boreal communities, who have voiced their concerns about the damages caused by their anti-forestry campaigns. First Nations, unions, and leaders of boreal communities have all reached out to Greenpeace only to be ignored. At a recent press conference, frustrated representatives from communities across northern Ontario – including First Nations, mayors and unions – called for an end to activist distortions about Canada’s forestry practices. Boreal communities depend on forestry and recognize that the forest provides a sustainable and renewable resource. Community leaders also understand that decisions about forest management policies in the boreal forest should be determined based on sound science as well as the potential impacts on the hardworking people who live and work in the boreal. They should not be based on the irresponsible and unsustainable demands of misinformed activists like Greenpeace whose proposals threaten the future of these communities. But anti-forestry activists like Greenpeace continue to disregard the concerns of boreal communities in an effort to promote their own agendas. When these communities reach out to Greenpeace and their allies, they are ignored. Those who live and work in the boreal forest are most intimately acquainted with the reality on the ground. They know that Canada’s boreal forest is far from endangered, and they want policies based on sound science rather than fear. Most of all, they want to ensure that the boreal continues to thrive and sustain their communities for generations to come. 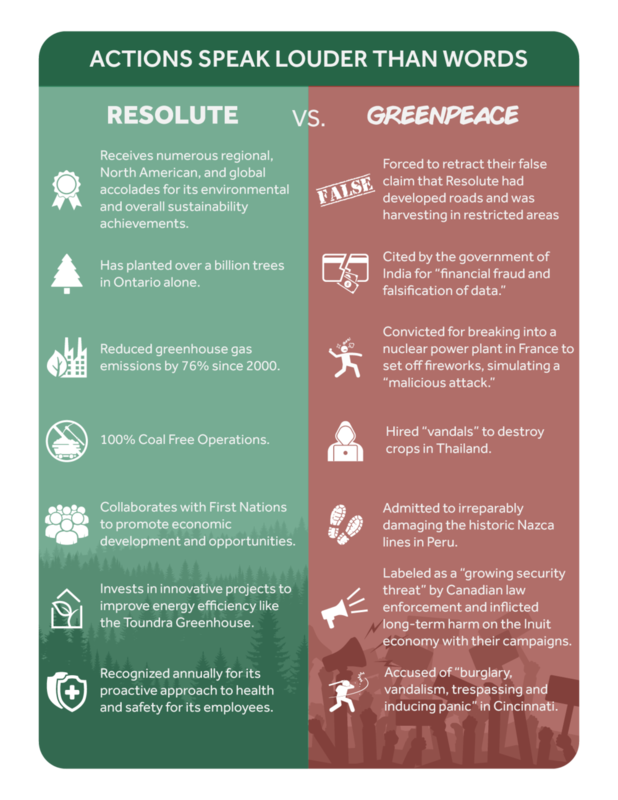 Greenpeace and their cohorts continue to spread false and misleading information about Canada’s forest management practices. Their campaigns call on forest products companies like ours to halt operations, threatening thousands of jobs and livelihoods in the process, or seek further regulations from the Canadian government. But these groups’ claims about Canadian forestry practices are full of hot air. Here are 7 facts about Canadian forests that they omit from their campaigns. 2. Canada’s deforestation rate is very low – less than 0.01% each year – and that rate is actually falling! According to Natural Resources Canada, deforestation in Canada is generally the result of land conversion for agriculture (43%), resource extraction (34%) or urban expansion (12%). 3. Less than 0.5% of Canada’s forests are harvested each year – that’s about the half the size of Connecticut, but spread out over all of Canada. It’s also far less than the amount disturbed by insects, disease and forest fires combined. 4. Canadian law requires that 100% of harvested areas be regenerated. In Quebec and Ontario, the provinces in which Resolute operates, about 75-80% regenerates naturally. The other 25% is promptly reforested. 5. Canada is a leader in forest certification with 37% of all the world’s certified forests. 48% of Canada’s forests are certified by third parties, ensuring compliance with recognized standards of sustainable forest management. 6. Canada’s boreal forest is a source for people’s livelihood through direct employment – in harvesting and regenerating forests, and in manufacturing operations – and indirect employment – the grocery stores, schools, hospitals and thousands of other businesses and organizations that depend upon boreal communities. 7. The Canadian forest products industry is crucial for Aboriginal communities. 17,000 Aboriginal people are employed directly or indirectly or make their living from the forest products industry, making it one of the largest employers of Aboriginal people in the country. In August, we became aware that an article about our case was forthcoming in the environmental advocacy publication InsideClimate News. Since Nicholas Kusnetz, the InsideClimate reporter writing the story, had not reached out to us, we wrote to him proactively. We pointed out that the outlet has close financial ties with Greenpeace and its allies, and asked him in good faith how his publication could possibly engage in objective reporting on this matter when its top editor and publisher, David Sassoon, has been a paid consultant with Greenpeace, a fact reported in a variety of publications. First, is it true that your boss and publisher, David Sassoon, has been a paid consultant on policy and public relations to Greenpeace? How much was he paid by Greenpeace and is he still operating his professional consulting firm for environmental NGOs? Also, a review of your reportage shows an extensive list of articles casting various activist campaigns in a highly favorable light, particularly when they are aiming at natural resources companies. The same could be said of InsideClimate as a whole. In light of that tilted perspective, how can we be assured that your reporting on Resolute will be objective and even handed? A number of outlets have also raised questions about the objectivity of InsideClimate’s reporting, given the fact that they share a number of donors with activist groups like Greenpeace. On the funding page of their website, InsideClimate lists Greenpeace donors Ford Foundation, Grantham Foundation, Park Foundation, and Rockefeller Brother’s Fund. The Ford Foundation has even publicly repeated Greenpeace’s flawed talking points regarding companies that attempt to stand up to attacks from environmental activists. Kusnetz offered no substantive response to our inquiry regarding its obvious conflict of interest. Yet the resulting article, full of skewed and selective sourcing and notable omissions, speaks for itself on that score. Kusnetz writes, for instance, that “[t]here's some disagreement on whether Resolute's logging practices stand out from its peers—many environmentalists say they do, but some people familiar with its work dismiss the claim.” That is the sum total of time and detail Kusnetz lends to scrutinizing Greenpeace’s misleading allegations. Some say X, others Y. Readers aren’t offered evidence for the competing claims — for instance that Resolute has been multiply awarded as a global leader in sustainability — or even told who is making them so they can assess their relative credibility. In our own case, Kusnetz’s piece ignores a similar outcry from First Nations leaders and thousands of citizens in both Quebec and Ontario, the Canadian jurisdictions in which Resolute operates, who have expressed concern and condemnation of Greenpeace’s misinformation campaign. Leading trade unions representing workers in the boreal region have also repeatedly denounced the economic damage and threats to jobs caused by Greenpeace’s misleading attacks and unwillingness to engage with their communities. We made Kusnetz aware of this, but he chose to ignore it. The distorted, one-sided view of the case and its merits on offer from InsideClimate News, and the basic failure to disclose, let alone justify, their financial conflict of interest with Greenpeace, speak volumes about the organization and its priorities. Readers would be right to view this piece from InsideClimate News with the utmost skepticism and scrutiny. When Greenpeace and its allies attack companies with misleading campaigns and capricious demands, many corporate leaders are quick to give in, hoping the activists will relent and move on to their next targets. But as we’ve pointed out before, companies that embrace a strategy of appeasement can expect repeat attacks. Our company chose a different path. We drew a line in the sand, and defended our integrity, which is a duty we owe all our stakeholders and especially the communities where we live and work. And how have those stakeholders reacted to our effort? Mostly with encouragement and often praise that it’s about time this kind of principled action was taken. Here are some examples. Resolute’s stand against Greenpeace has been discussed favorably in many outlets, including the Wall Street Journal, Washington Post, Financial Post, National Review, Globe and Mail, and Toronto Sun. Canadian stakeholders and prominent commentators took to Twitter to show their support for our stand against Greenpeace while pointing out their deceptive claims. Greenpeace's statement to WSJ is a masterpiece of a nondenial masquerading as a denial. Last summer, over 4,000 people marched through the streets of the small northern Quebec town of Saint-Félicien, demanding an end to misleading activist campaigns. Tens of thousands of concerned citizens participated in a post card campaign demanding Greenpeace and its cohorts involve local stakeholders. Recently, trade unions representing workers across Quebec spoke out passionately about the economic damage and threats to jobs caused by Greenpeace’s irresponsible attacks and unwillingness to engage with their communities. Additionally, First Nations, local governments, union leaders, industry associations and individuals wrote letters, reached out by phone and on social media, and spoke out asking for Greenpeace and its many allies to listen to their concerns. But they continue to be ignored. We will continue to stand up for our integrity against reckless attacks while working with those who support our efforts to protect the future of boreal communities. An article in the environmental advocacy publication National Observer purports to “reveal fresh insight into a major lobbying” effort by our company in opposition to a proposed measure that came before the Ontario legislature in 2015. But in reality, the article distorts what took place, hides critical facts from readers, and is badly slanted in its analysis. Resolute’s concern was that radical groups would use Bill 52 to shield themselves from potential legal recourse after making defamatory statements, and in particular, statements intended to harm job creators in Ontario. Our concern was that Bill 52 was unnecessary legislation that would have the effect of providing an unwarranted advantage to radical groups. That’s why we had a direct and natural interest in the legislation, and it was perfectly appropriate for us to share our viewpoint with the Ontario government. There was nothing hidden. We provided the letter to many other public officials as well. That outreach is a routine part of our democracy and a bedrock right that all Canadians share. Citizens and stakeholders of all sorts do exactly the same every day, including environmental groups and news organizations. Indeed, it seemed all but apparent that the bill’s sponsor had worked in close coordination with environmental activists as the very measure was being drafted. That was confirmed when the bill’s author explained in front of the Ontario House: “I am more than excited to speak about [the bill]…It was a lot of work, over a year [and] I worked with a lot of environmental groups.” He cited three environmental activists specifically with whom he had “worked very closely with in drafting the bill.” He also singled out Greenpeace and two of its executives, Shane Moffat and Richard Brooks, thanking them for their assistance. The National Observer withheld these key facts from the article. So apparently, environmental groups including Greenpeace had a direct influence on the actual composition of the draft law. Resolute then wrote a letter to voice our position — and somehow National Observer imagines that our company was the pivotal player in the situation. Why would National Observer slant the article in this way and leave Greenpeace’s role unexamined? Perhaps it is because Greenpeace and National Observer both receive financing from the same environmental activist donor, Tides Foundation. As public disclosure forms reveal, each have received significant sums from Tides. We pointed this out, on the record and repeatedly to the National Observer reporter — and yet this brazen conflict of interest was also concealed from readers. UPDATE 9/14/17: NRDC has presented more ill-conceived and misguided arguments about Resolute’s position on sustainable forest management. In their latest post, NRDC says that the Canadian government ought to do more to protect the boreal, when there is ample evidence, including the new report discussed below, showing that Canada has some of the strongest forestry regulations in the world. Furthermore and contrary to their claims, we fully support and are in complete alliance with FPAC’s policies. In fact, Resolute is an internationally recognized leader in environmental stewardship and responsible practices in the boreal region, a fact the post fails to mention. These are serious issues that call for substance and nuance, but unfortunately none of that is on display here. For months, NRDC leaders Rhea Suh and Anthony Swift have ignored calls from boreal residents to visit the region to discuss the real impact irresponsible activist campaigns are having on their communities. Will NRDC’s new Washington, D.C.-based “boreal expert” have the integrity to come hear directly from the communities that she is trying to impact from afar? Seems doubtful. We have previously exposed Natural Resources Defense Council’s (NRDC) intellectually dishonest attempt to undermine research demonstrating that forest resources in Canada are among the world’s best regulated and managed. A new report from NEPCon (produced with the support of the Forest Stewardship Council®) provides further evidence that NRDC’s claims are misleading and irresponsible. NEPCon is a well-known international non-profit organization that performs certification audits for the FSC and PEFC (Programme for the Endorsement of Forest Certification) standards. The NEPCon report cites numerous certification and sustainability groups including the World Business Council for Sustainable Development and World Resources Institute who find that Canada has “the lowest prevalence of suspicious log supply and corruption of any country” as well as a low risk for illegal logging. Further, the World Bank includes Canada among the world’s Top 10 countries when it comes to respect for the rule of law. As for Canadian harvesting policies and enforcement, the report concludes that “laws are upheld” and instances “where laws/regulations are violated are efficiently followed up via preventative actions taken by authorities and/or relevant entities.” The report reaches the same conclusion when it comes to species protection, “the protection of socially and ecologically important sites,” compliance with environmental regulations, health and safety requirements, trade, and transport. It has now been 10 months since boreal communities, union leaders and trade groups reached out to NRDC Director Rhea Suh in good faith to ask questions and share concerns that NRDC’s claims didn’t represent the reality on the ground in the boreal forest. They still have not received a visit from NRDC leaders or even the courtesy of a phone call. NRDC’s unfounded claims do a disservice to the hundreds of thousands of Canadian forestry workers who are committed to responsible practices.